Clint: What a great guest I’ve got today. It’s Shondra and she’s from Oregon in the United States, welcome Shondra. Shondra: Thank you so much. Clint: Yeah thanks for joining me. You’ve got a story that I’m very familiar with because you’ve been part of our online support group for the last 12 months, and I’ve watched your journey and commented and given some guidance here and there with you personally and it’s been absolutely awesome to see what you’ve achieved. Normally I have the guest tell us the snapshot of what they’ve achieved but I’m going to take the honors if that’s okay and give it. Clint: So you were diagnosed with psoriatic arthritis in May of 2017. And as we’re recording this today it is late May 2018. The doctor put you straight under methotrexate, and straight on to some nonsteroidal anti-inflammatory drugs. And then you began our program and then I will let you fill in all the details. But now you’ve been off methotrexate, off painkillers for the last six months and you feel fantastic. Clint: Isn’t that wonderful to hear someone tell you that back to you. Shondra: Yeah, it’s amazing! I really didn’t think it will ever happened to me. Clint: Awesome! Well, tell us how did the symptoms begin for you and were you diagnosed quite awhile after the symptoms began? Was it something that you kind of delayed seeing a rheumatologist or how did it all sort of play out? Shondra: Yeah, all my rheumatoid or psoriatic arthritis symptoms started in December of 2015. I just woke up with a sore neck. And I thought “It was strange, I must have done it weird and tried to exercise it out and move it out and it just didn’t go away. And then not more than a few weeks later then I started not to be able to move my jaw, my shoulder started hurting and was kind of this strange aches and pains I never had before. And then it just really started ramping up from there where it wasn’t just a small ache or pain it was intensely painful where in my knees, I would go down to bend down to tie my son’s shoes and it was just, they felt like knives were in my knees and I started not being able to chop vegetables or open up cans because my wrist was so sore. I can’t put on the (inaudible) in my car, can’t take my clothes off at night and get my pajamas on and things like that my husband started to help him with those things and it just really became bad, really painful like extremely painful. Shondra: And then eventually it got into my foot and I started not being able to walk. And my foot felt like it was deforming and just really odd I couldn’t wear my shoes anymore. And those sorts of things so I just eventually went to a rheumatologist after months and months of being with my naturopath trying to figure it out and trying different things based on what she thought. We (inaudible) at the time so we are trying to treat that and that was kind of a side thing which I can talk about more and hear more about that but that’s kind of how it led him to the joint pain, kind of we weren’t quite sure what was causing the joint pain and then eventually after about, it was probably a year and a half where the joint pain just went and going away. I started thinking okay there’s more to this and she sent me to the rheumatologist. Clint: Right okay. Now yeah it talks a little bit more about the endometriosis sort of possibility and whether or not you made any progress with that. Shondra: Yeah, it is strange really related to the story I originally went to a naturopath because I was having such terrible cramps and bleeding and intense fatigue. And she did check my iron and I was extremely anemic. The monthly bleeding was turned it to get worse and worse and worse to the point it was hemorrhaging and it was happening any time and very unpredictably and so she was trying to help me manage that and trying to do so naturally and did so for a number of months and wasn’t seeing any change. She normally does and (inaudible) problem. So eventually I ended up going on what’s called the mini pill, which is just progestin without the estrogen. Shondra: And that was, I think it was around October 2015 so just a couple months before the neck pain that he mentioned started. And then I was on it for a couple months, and that was when the jaw, I couldn’t open my jaw, I couldn’t get my toothbrush in at night. Those are the things that was (inaudible) couldn’t break down on food, and so it started getting so bad she said Okay let’s take you off of those just in case. At the same time I was also doing weekly iron infusions because I was so anemic, and so I thought well maybe the joint pains from the iron infusions or the joint pain from the progestin and we didn’t quite know but. I don’t want to be on the progestin anyway to begin with. And so it was like let’s just get off of it, because I didn’t want to be on anything. And so I continued with the infusions, the iron infusions because I was so anemic. And that didn’t seem to provoke the joint pain, (inaudible) and it stops. But then my hemorrhaging got worse again, and my anemia got worse again, and the iron infusions weren’t even touching (inaudible) lower and lower. Clint: Wow this is a mess. Okay so, you must have been like in a very very delicate emotional state, confused, worried, all of these things heavily dependent on the naturopath. Yeah this is a difficult time when you’ve got these different treatments going on where one supports the other, and then the other supports then you take one off them because you can’t be hemorrhaging. You can’t be (inaudible) you can’t have the joint pains getting worse. So what a conundrum right? Shondra: Yeah I say, which one do we go for here? And the anemia was getting bad enough that you really try natural progesterone and thinking that it might help and it kind of did but then it just made it wacky all over the place. And so then it ended up not working after a while we tried that for about six months. So then I went to see an OBGYN she recommended having surgery and I was completely against that, and so at that point I went on. Well I I think actually at that point I decided maybe we should head towards surgery, because I guess it was earlier that she recommended. I had seen her year before she had recommended surgery, tried all those other stuff and then at this point I said Okay. (inaudible) do something else because nothing else was working, and the joint pain seems to be a product of every time I go on birth control. Clint: Well it’s really interesting that link isn’t it? We know Earlier episodes I’ve done on this podcast we had Dr Richard Matthews on here who talked all about the relationship between hormones and rheumatoid arthritis. And he explained about how during pregnancy we can often have a reduction in symptoms with rheumatoid as those hormones are actually so different than what elevated compared to what they are normally during non-pregnancy times, normal times. But then they fall precipitously after childbirth and so then when the hormones then fall back to their normal state, this can really really play havoc on inflammation. And often be a trigger for ladies who are close or I want to say something like pre rheumatoid or pre psoriatic or pre inflammatory arthritis whatever it be. And so we know that there’s the strong link there, and you were commenting on some other people’s comments about their feelings that maybe birth control does play a role somehow in the inflammatory state. So okay well I’m intrigued as to what happened next in this story. Shondra: Actually most of the doctors are saying no it didn’t have any role, and they didn’t think it had anything to do with the joint pain, and they had no idea why I was getting the joint pain. So it was kind of odd, I felt like I was asking the questions but no one had the answers. But I did end up going on another birth control called Orth Tri Cyclen, I had been on that when I was younger for the same reason, for being anemic and I was fainting and things like that. When I was younger and so I had been on that for about 10 years before I had children. So (inaudible) you did well on that before let’s try it just for a couple months until we can get you to the surgery. And so in those three months then the pain came back, and that’s when my foot ended up being so bad that I could hardly walk and my wrist got so bad I couldn’t write anymore or cook you know different things like that. So I ended up having the surgery and as soon as I was done with the surgery I went off the pills. Clint: Okay. So I know this is just our opinions, but in your opinion was there a definite correlation between the birth control and your inflammatory symptoms? Shondra: Yeah. Every time I went off of it started to taper off, and when I went back on them even though I was for a couple of months it just seemed to fire right back up. Clint: Okay well you know I think everyone doesn’t need to. if they’re listening to this everyone doesn’t need to freak out about their birth control, if they’re you know trying to work on their you know inflammatory arthritis. But I think it’s worth everyone making a mental note, and it is a piece of this puzzle. And I think they can take action if they want to or if they don’t want about considering whether or not the birth control is necessary for them in their life or not. if they’re looking for more and more ways to try and minimize their inflammatory arthritis it could be an approach for some people out there to think well look I’m not needing it anymore maybe I’ll try without it. Shondra: Yeah it is a difficult decision. I mean even I had three kids and it was a hard decision for me to go with the surgery, because that means you no longer can have children. And so either have this case of the iron deficiency anemia continue the process the hemorrhaging, and having to be controlled somehow. But the surgery really saying that that means I was done with having children, and so it’s a difficult decision for sure. Clint: We’ll continue with your story in a second. But I got one comment which is thank goodness that you’re able to be blessed with 3 kids, that’s amazing. You know we’ve got our third child due in about 6 weeks, and we feel so grateful. Given my background and everything and my prognosis of not being able to have children, so I mean where obviously I can appreciate how much joy that you must have from having 3. That’s not bad. And then the other comment was the anemia you know like I don’t want to just like to just brush over that before we continue. Why do you think you’re anemic when you are young as so much so? And why do you think it’s always been in place? We know there’s two forms of anemia, there’s iron deficiency anemia and there’s anemia of chronic disease. And iron deficiency anemia is the one that we all think about, which is what you were treated for which is low iron. Right. And the anemia of chronic disease is when the body is in a high inflamed state, like many of us with inflammatory arthritis. If our bodies are highly inflamed what the body does is then withholds iron from the blood so that pathogens that thrive on the same iron that our body uses pretty much can’t continue. It’s like holding back the food supplies from the enemy they can’t continue. Clint: And so my rheumatologist explained to me that with anemia of chronic disease we treat the inflammation, and then the anemia of chronic disease resolves itself consequently. We don’t go out and try and add iron to that situation in fact it can be dangerous. So look that’s just a bit of sort of generic information, but I’m just wondering why do you think you’re so anemic, so young, and for so long? Shondra: I think my periods were very heavy and so the amount of blood I was losing every month, apparently was more than my body could keep up with replacing. But I’m not sure and, because when I was younger earlier (inaudible) wasn’t to the degree it was as a recently. But I don’t know, I didn’t ever have my own checked when I was young. They just said, oh you’re fainting or you’re feeling faint, and that happened a few times you know that sort of thing here just go on birth control and didn’t really question it they just figured it was because I was bleeding too much. Clint: Okay so we’re not certain. So when I say you’re anemic we’re not certain about that, but we were certain that you felt weak that time of the month and doctors didn’t like how it kept happening and they just go on birth control and that all stopped that. Shondra: Yeah it wasn’t until I saw the naturopath a couple of years ago that she actually tested my iron, and said oh wow you absolutely are anemic. And then it continued to drop, and drop, and drop when we saw the levels. She did my blood work every 3 to 6 months checking to see how they’re doing and it just kept going down and down and down. Clint: So did the iron infusions, were they effective or not? Shondra: They were for a while, they were. But then they stopped being effective or we just said not to continue with them because of the question and where are they causing more harm than good. If it were they did have an inflammatory arthritis as you say. Was there anemia of chronic disease going on here? Giving the iron was actually going to do more damage and so we stopped at some point. So they would help for a little while but then until I got the surgery, we just continue to (inaudible). It would help a little while and then I would just continue (inaudible) you know. Clint: Okay well thanks for helping me go into all that detail, because I was just curious. I don’t like the open loops and not understanding part of it. So thanks for that. Shondra: Yeah and it complicated the whole matter you know. Clint: Well they all interrelate, don’t they? Clint: Okay so now you had the surgery, how did it go and what happened after that? Shondra: The surgery was okay. The crazy thing was about a week after the surgery, things were supposed to get better. I was supposed not bleed anymore and I ended up hemorrhaging like crazy more than ever before. I had to go to the hospital to get some iron infusions because I had lost so much so quickly. I went to the hospital a couple times to do that. And so they ended up giving me my progesterone to stop the bleeding because it was either that so it was another hard decision. Do I keep bleeding and see if it stops, or do we stop it? And initially I said no I won’t take anymore progesterone, I’m just would rather keep bleeding and they said Well then why did your blood transfusion. Shondra: And so I said well okay I’ll take 2, because they said if you can take 1 today, and then 1 in a couple days. And then I said I’ll do that, I’ll do it today, and in two days but I won’t take anymore. Because I wasn’t willing to go into anymore joint pain and I don’t think they understand how bad, how much pain joint pain can actually be. A joint pain sounds like oh yeah it hurts a little and I bend my wrist but it’s excruciating, the amount of pain. It wasn’t just Oh I can’t lift my arm very well and it hurt a little, it was an intense amount of pain and so I was really hard for me to decide which I’d rather do. But once it came to the question of transfusion I knew I did not want that either, it has its own complications. So anyway, so that did end up stopping the bleeding after about a week (inaudible) September (inaudible) and then I’ve been fine ever since as far as the bleeding is concerned. Clint: Wow okay. Right and no more of the progesterone? Clint: Okay. So good, good. But then after all of that, you then said now I’m going to face the next major challenge which is the joint pains and that’s when you showed up to the rheumatologist. Take us through that. I’ve given a little summary at the top but let’s let’s expand on how this process went, and you’ve got maybe like the gold medal of speed. I think we’ve only got one other person who has been able to start meds and get off them as quickly as you like 12 months. In fact you were like six months and then. Shondra: I was on it for 7 months. Clint: 7 months. Okay. So this is some kind of record right? So you have some insights that you could definitely share with others that we’d like to go over. Yeah. Let’s walk through this chronologically, you went on how much of methotrexate did you go on? How many painkillers? And talk us through starting the program, and how things unfold. Shondra: Sure so I went to see the rheumatologist which was, it was quite a weight to get in and getting on the waitlist and they called me and sooner than I expected. So I was able to get in there and May of 2017, so I had gotten off. My surgery was on December and so I’ve been off of the progesterone for several months so we knew it was well out of my system. So I saw her in May of 2017, she did put me on 59 grams of injectable methotrexate once a week. And then she went me on and said she give me Naproxen and wanted me to take that. So I did start the Naproxen. I wasn’t sure I wanted to do them at methotrexate, actually in my heart I knew I didn’t want to do it. But she did x-rays and she give you this grave prognosis that she had. She saw it in my x-rays, she said I had damage already, that my bones had been already eroding and my wrist and then my foot. If you don’t see will end up in a wheelchair eventually (inaudible) What if I don’t? You know what’s the worst that can happen? And kind a give me the reality of what the disease really was and what my prognosis could have been. And so despite not wanting anymore medicines because I didn’t see this point. Medicines have done no good for me at all. Shondra: I decided to (inaudible) I did decide to go on them, and partially because I had watched some of your podcasts and had heard methotrexate and you weren’t oppose to them. And so okay a reasonable guy like you who believes in the healing nature of food and natural medicine in a natural way about it can actually even agree that methotrexate can do some good and some reason so I reluctantly did start on it, and so I did for a couple weeks. I did start on those as well. Clint: Yeah, let me comment on the methotrexate. So the way that I view medications is and I’ve got a video on this which is on YouTube, and it’s called Do I need to take rheumatoid arthritis medication so people can refer to that which goes into more detail. But the crux of it is this, if you’re doing everything that’s possible even the natural perspective. And your symptoms are still slowly getting worse then you have to take medications, because the two non-negotiables of our program are not allowed to get worse and never allowed to have high inflammation levels. Now they go hand in hand but they are slightly different, because on a day to day we measure our inflammation levels and on a month to month we measure whether or not we’re getting worse based on our blood tests and just general trends that we can pick up. And so we’re monitoring each day if I’ve got high inflammation levels. It’s causing more leaky gut, and so you’ve got that vicious cycle going. We’re not allowed that, we’re allowed to the worsen because that will result ultimately in a joint degradation and so on. Clint: So, if we’re doing everything possible but one of those is still being broken then we need to take some kind of drug, because we have to suppress the inflammation because it causes more leaky gut so we can’t win. So that’s why. It’s another tool and we can use methotrexate as a tool like when we use crutches for a broken leg, allow some time and in the case of the methotrexate it might be a year or two or in your case just 7 months. And then you hit the milestones and work with the doctor to reduce those drugs. So yes that’s putting it into my view of the world which is just my opinion. But what I see when people do this like yourself and that’s how I did it and how many other folks who do this get really good outcomes. And so I like it. So okay good, all right, please continue. Shondra: Yeah so well actually, like I said I wasn’t going to start and my husband found you online on YouTube. And you know he had never heard of the many people talking about psoriatic arthritis and he saw your podcast. And so it was Nicole and she also had psoriatic arthritis, he was like you gotta see. And they talk about methotrexate and they are talking about ways to heal it. And I said Oh yeah, I just couldn’t think of taking on another thing, because through the process of the endometriosis and the bleeding and everything I tried so many things had done gluten free, dairy free. I have tried kefir and kombucha and the gout diet, and just all sorts of dietary things and natural things and herbs and supplements everything, and as I just I couldn’t take on trying and thing and having it not work is just too much work. But you know I think really I’ll look this up and there is really something to this. And so then when you then like I said, you did mention methotrexate I said alright I think what I’ll do, is I’ll do both. I’ll do the Paddison Program and I’ll do methotrexate at same time. So I started probably about 2 or 3 weeks after I had been diagnosed, I started both at the same time. I did stop the NSAID as soon as they started your program and not realizing what a rookie mistake that was. And then now I realize that was a bad idea because it did not get resolved straight away. When I did the water the juice fast which is insanely hard to do. But he did the cucumber juice and the celery juice did and that at the end of the weekend I’m still was in just as much pain as I was at the beginning. And then I decided well maybe I do need to be a member of the forum, I was trying not to because I don’t want to spend the money. But so then I go on there and I said I didn’t have any results and exactly what you said was like, because you shouldn’t have gone off the NSAID’s right away. Oh okay so I got up on the NSAID’s and continued with your program and actually felt like it took a really long time to see any result and it was pretty discouraging. Shondra: You know remember even 6 weeks into it, I was writing down every day. I write down what a did, and how I felt to my pain levels, and they were at even with the NSAID’s they were at 7 or 8 on (inaudible) were just just so excruciating as hard to even think. And I (inaudible) school my kids and I have 2 part time jobs that I work as well. And it just is so hard to do the diet and do the program and not have any change. So I was very discouraged after about 6 to 8 weeks, but I watched one of your podcasts it said to keep going. And I guess I would say one of the biggest things that helped I watch something that you had said. So I feel like even just say off the cuff I don’t know if it was something you orchestrated that they’re saying but someone had asked me, what do you do if you’re tempted in one eat something? I don’t remember what it was I wanted to eat. You said, you have to want this more, you have to want your health more, and you have to want the healing more. And that just really resonated with me, I just had (inaudible). So from now and that was kind of big became my mind track kept in my head. I want this more, I want the healing more, and not just the healing but the life that would come with the healing that I can’t be there for my kids. That I could not be trained to push through the pain and put on a brave face and be there for my kids. But that it would really be able to be there for my kids, and really be there for the work that I do and the people that I serve and different things like that, I wanted that more. Shondra: And so as they went through it, even if I didn’t want to go exercise I would say I want this more, and even if I didn’t want to eat foods that you were eating, and I was tired of quinoa or I really wanted something delicious to eat that other people around me were eating. 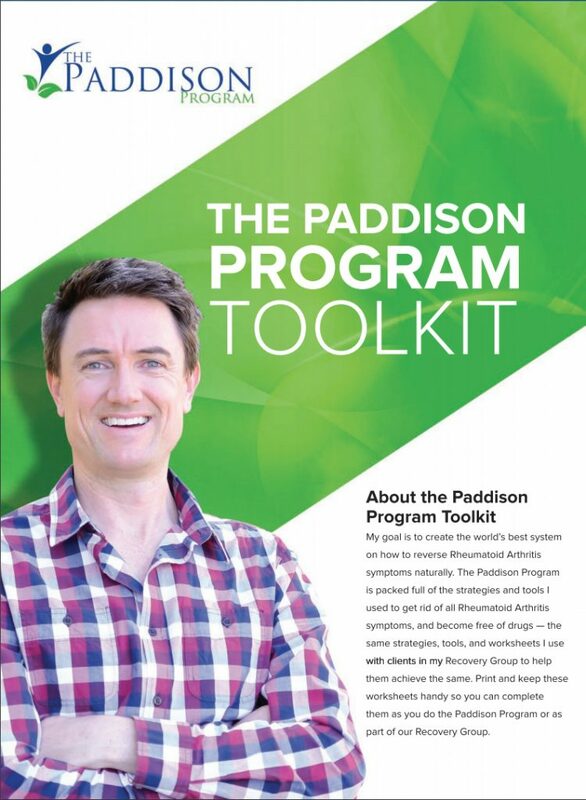 That kept me to stay a 100% on the Paddison Program, and I’m kind of an all or nothing sort of person. So I just went 100% no cheats, nothing. Strictly even during the holiday I remember on the forums, people say oh well I did fine except a little bit on Christmas I did this or that sort of thing. I just didn’t feel like I could even go there, even just a slight bit of it I didn’t want to take the chance and take the risk going of go wrong so I didn’t make any variations to your program. I stayed on baseline for a really really long time, and just introduced oats and a couple of fruitss, that was it. Anything that go with almonds or anything. Clint: Yeah, what you’re doing is the almost what I would say is a textbook approach which is stay baseline for a very long period, be on a gut safe drug to suppress a lot of the symptoms so that you’re not working against an impossible in inflammation level. You’re exercising regularly which is crucial, and yeah just stick and with it. Just go for it and bringing the oats in excellent cause it just adds all different diversity and quality to your gut bacteria. Cool, Okay. So you mentioned your 6 to 8 weeks in before anything really significant change for you so you must have at some point around then or thereafter felt some improvements. Shondra: I did start to feel a little improvement where maybe one day I’d say, oh you know it’s not an 8 anymore, maybe now kit’s down to 5, and then down to a 3. And so at that point once it was around the 3, I ditched the NSAID’s, the naproxen just as soon as I could get off of those I did. So it was about that about that period of time where (inaudible) pain did go up a little. And what you said to me in the forum was then up your exercise a little, so I did. And that absolutely made a difference. So I was exercising 2 to 3 times a week, and I did up to 5 to 6 times a week. Clint: Brilliant, yeah there you go. Shondra: It brought those pain level right back, and so then I was able to function at about I mean I started to get down to pain levels around 2 maybe around August. I was feeling much better, but I didn’t go back into my rheumatologist for a re-check and she looked at my wrist and my foot and was not happy with what she saw. It was still red, she’s still really inflamed even though the pain was going down. And I was starting to be able to my arms again and open car doors, and things like that again. She said, no you need to up your methotrexate and so we went up to 20, and then a few weeks later well maybe a few months later I remember for sure but we eventually went up to 25, the maximum dose. Because my foot was quite deformed, I was not able to walk well, I couldn’t hike or wear any kind of shoes, and so we ended up going up to 25. Clint: Okay so a lot has happened in these 7 months. So you’ve got an up to 25 then fairly quickly. Similar kind of story to my own by the way, I started on 10 mg of methotrexate didn’t last very long probably a couple of months up to 15, and then maybe 17.5 to 20. Then straight up to 25 and that’s when I had my kind of I will do anything it takes in the whole world rather than continue this path moment. Clint: And that was the pivotal time when those discussion Melissa and I were in the rheumatologist office and he’s talking about adding other medications and stuff and I just drifted off and thought you know this has got to end. This is going like, I’m doing a lot, like I’m trying hard but I’m not doing everything in my human power. There’s another depth of discipline, another depth of determination, and another level of all in that I can go. All right, so if the methotrexate is going up even though your symptoms seem to be getting better, at what point did things totally turn around and when you started to get the rheumatologist to work with you and go in the other direction with the drugs? Shondra: One visit she had wanted me to add sulfasalazine. Shondra: I said no, no I can’t do it. And then the methotrexate was making me exactly as you say just like it was making me so sick, and I just was nauseous all the time. And I just, I was feeling like a zombie like my head, I was just not in my head I couldn’t think clearly. I just felt like every morning it was just a chore to get out of bed, and I had to start pulling out of things if I couldn’t teach if I knew I was going to be vomiting you know things like that. And it was really really affecting my what I could do, I just can not do this and so I just got to the point where, because I was my pain level was around a 1 at this point. I remember watching your video on when when get off on methotrexate, I think that’s what it’s called. Shondra: Over and over, and over, over a period of weeks, and to say okay how can I get, when can I get off of this? And so when I got to that point about December I knew I had a holiday break it was going to be winter break because one of the things you said was make sure you can tolerate pain bump. And also that I could go back to baseline foods, and also increased my exercise. I was like ready to do anything to get off of it. And so they were messaging you like how soon can I get off of this. So you recommended China go down, and so I emailed my rheumatologist and got her permission. I told her how I was feeling, and so I went down to 20 and then I emailed her. Maybe only a week later I was feeling well (inaudible). And each week it was so hard to give myself that injection, I just would tell my husband I said I’m not gonna do it. And he said, no you’ve got to do it. And so it was about 6 weeks were just how to talk myself up every week of doing it. Late Friday night so weekends I recover as I get home school on Monday morning (inaudible). It just went all week long where I just, I thought it was just the weekend I was going to feel terrible but it was going to have all the time. I was like, I’m done. Shondra: I just couldn’t do it anymore, and gone down to the 15 and it was going okay. I went to my rheumatologist and I think she could just see the look on my face where I just couldn’t do it anymore. And actually I was in tears and I said I’d really like to give this a try. I (inaudible) my diet, and this exercise program that I’m doing and I just want to try can we give it just a couple months to see and she said okay. She’s like, she said to me, do you look like the type of person that needs to try this. (inaudible) not clearly it would work. but knew I just to do it. And so I just went cold turkey after that and never injected again. Clint: Yeah. Wow okay. Very very brave and cool. Hey I just want ask you about the nausea. There’s a couple of different approaches with the folic acid that normally gets taken with the methotrexate. And I’ve never asked this question when the methotrexate is injected. I’m familiar with the approaches when it’s a tablet format. Are the two approaches are normally take one or two milligrams of folic acid every day except the day that the drug is administered. And the other approach is to take no folic acid except a large dose of maybe 5 mg the day before methotrexate, and it then gets metabolized by the methotrexate the next day. Which were you doing? Shondra: Yeah I was doing it every day, I had a folic acid every day regardless of whether I was injecting, honestly I don’t remember the dosage, I’d have to look back. Clint: Yeah probably a milligram or 2. Now I tell you what’s interesting, I’m developing anecdotal evidence to suggest that people who do the folic acid every day tend to have more nausea on the day that they take their tablet dose, and it looks like in your case. Now I never got that much nausea straight after taking my tablet dose of methotrexate once a week. And I’m wondering, and it’s just early stages of developing this thought that maybe it’s the folic acid metabolizing that happens that causes some of or contributes to the nausea and that by taking the approach of having a large dose of folic acid the day before, actually reduces nausea more than taking a small amount every day. Clint: I’m seeing a couple of people and I asked this question now and I’m hearing that answer, the daily tablet approach when people are having the nausea. And so anyway that’s just an interesting observation if people are listening and they say hey, if you get a lot of nausea and you take a small amount of folic acid every day except the day you do your dose maybe talk to your rheumatologist about doing what I did. Recommended by him of course to all these patients including me which is a 5 mg folic acid the day before. Now when my ALT and AST liver markers went up because of methotrexate can do that to the liver. He then recommended an additional 5 mg of folic acid the day after my dose as well. And that got rid of that problem okay. So anyway whilst I’m talking about this topic I wanted to add that as well because I’m sure some people are facing these kind of issues, we know that those issues occur. Okay so you now you’ve come off, and I remember us liaising about because there’s this anticipation that happens after you come off the drug in your life. What is going to happen? And with every passing day particularly after about 2 to 3 weeks that’s when you start like really wondering if every day you’re going to wake up the pain is going to start coming back. How was your experience? Shondra: Sure it was just before Christmas and oh man it actually is fantastic. I felt like I was coming to life again, I mean not to be dramatic but it was really true I felt like a part of me had died and that part of me was coming back to life again that’s how extremely good I felt. And I guess I just felt like I never thought I would feel again, where I had that part of you that wants to do things you know or is inspired to do things that make sense. I felt like I have dealt either because I was anemic or because I was so sick or all of the above. That to be in a state where I was now off of drugs, and I was not anemic anymore, and I wasn’t in pain anymore, and I could move my body again. It just was, wow I never thought I could feel like this but yes I had some reservations. Like how long is this going to last? Well it just been initially for the first couple weeks but it continued on, and I have had a little bit of a pain bump here and there and when I do I exercise again or I increase my exercise. When you start feeling better to drop back down only 2 or 3 times a week. If it starts feeling painful again then I know I need to increase that back up. And now since it’s been months, after a couple months of feeling good you started adding additional foods such as almonds and I did add beans, and so I haven’t had any negative ramifications of that. Shondra: There have been a couple times where I’ve gotten a hold of oils, and by accident where my husband made popcorn and usually I’ll have it a little bit of air popped popcorn and he’ll make a little bit of coconut oil for the kids. I accidently got the one with the coconut oil, the day I was doing the laundry and I couldn’t move my arms and it was so painful and it was just I mean I had to be just a tiny bit of oil. And so I feel like now I’m at the point where I can really feel it, where my limits are. And so that’s all the say, I haven’t added very much food back. I had lost 20 pounds on the Paddison Program and now I and since then I’ve added almonds and beans back, I started getting a little bit of that back which is fine I didn’t mind losing the weight. Because it was funny was because people were so concerned about me losing weight, because they felt like I was just wasting away. And I wish I thought was funny because they were concerned I was losing weight but they were concerned that I might not be able to walk. Clint: It’s crazy. You know we this all the time, all the time. Yeah family members family members have you. Yeah exactly. You’re skinny therefore you’re dying right? But they see you and you walk in like I used to be like limping and couldn’t pick up things and do anything and they’re like go on meds. Well my family aren’t so stupid as that. But like I mean we’re generalizing, but people are terrified, family members are terrified of when you lose weight. It is completely disproportionate with weight loss as actually an issue. Shondra: But I know that comes up in forum a lot, and on your live calls a lot. And so to say I did lose 20 pounds and I dropped down way below what was normal for my body size and weight or should have been weight. And now getting it back now that I’ve been able to do it in just a few more things and it’s not causing and extra pain. Clint: Which is also like the teachings which are like, you know we almost like we take one for the team a little bit with our weight so that we can get the pain reduction. When the inside of your body is broken and you’re trying to fix it the outside might, as I said just take one a little bit while we fix on the inside. But once it’s fixed then we can, we get the rest of our life to eat and indulge and gain weight. As long as it doesn’t, of course we’re talking about sensible levels and not you know levels where we’re losing muscle mass to our connective tissue that makes it hard to you know. We’re talking about just cautious levels. Okay good. Alright so and where you are at now then? So that brings us to today, you’ve been off the methotrexate now for 6 months. Tell us what Shondra is sort of typical pain levels are each day, and how you feel? Shondra: Yeah. Well like sitting here I have zero pain. In my wrist, I still have some things that are hard to do. I can write again which is awesome but if I do write for long periods of time it will hurt or opening up can openers and you know certain movements like that or a certain door handles are you know things like that. They hurt but it’s only when I’m exerting force. Shondra: And then my foot those were the 2 kind of remaining places. In my jaw, and my shoulders and everything else is completely zero pain gone completely. So now it’s just the wrist and just the foot. And my foot will act up if I walk too far, and now I started to add different kinds of exercises kind of pushing myself a little bit and lifting some weight. So that does hurt my wrist sometimes or I doing different exercises with my foot and that can cause pain. But other than that just normal life doesn’t cause pain, which is amazing. Clint: Yeah that’s fantastic. And these things are reality, I mean I go to the gym and I can now lift 20 kilos on each arm during bench press, and then it will hurt my wrist the next day sometimes. But not in an inflammation way you know like you’ve got joint damage Clint, what are you doing to me kind of way. Do you know what I mean? Like give me a break, like you’re not trying to, from that age those old enough that I started to suspect that having muscles was a good thing as a boy. I’ve always wanted to have more muscle on my body, but I’ve never had a body that had much muscle on it. It didn’t matter what I ate in my 20’s the teenage years. I mean I used to just do all the heavy protein powders, and drink a gallon of milk a day trying to put on weight at times trying all sorts of various things. And I just don’t have a body that gains a lot of muscle, like I don’t have a big (inaudible). So anyway, so my body just doesn’t like it too if I try and push it too hard. Yeah especially I’ve got rotated elbows from the damage that was done, and that puts a weird angle on my wrist when I do workouts at the gym so there’s an upper limit to how much I can push things. Clint: And so what my point really is that, we have to be realistic that the diagnosis is very serious. And if we’re able to just have to maybe not push as hard on the door when you’re opening a door or even with your foot if you just need to maybe you can’t do elliptical but you can always do Pilates, big deal. You just do that, don’t you rotate your foot. These aren’t big compromises in life given the amount of problems that it could be. Shondra: It is really amazing. And I think what was helpful was one thing that you said was to remember it’s always like there is a cause the heart cause are still always burning. And that any time they can reignite, the fire can reignite. There is this monster that we’re living with and it never really goes away but we can keep it at bay. And I think that’s where I just remember. It’s always there and it’s not to ever go away, I just needed to learn what it takes to keep it under control. And I think that was just really helpful to realize, we are always going to live with this it doesn’t magically disappear. You know I think even when I was first diagnosed it’s kind of a grieving process I went through, recognizing the severity of the illness. Rheumatoid arthritis and most people think oh it’s just an old persons disease (inaudible). People ask me you’re to young to have that aren’t you? And just beats us to realize that there are some things that we will never be able to do or eat or those sort of things and a lot of things I had to let go. But I think I went almost went through a grieving process. I feel like I had all the stages of grief, anger, and all the different things coming to this acceptance of this is what I have and this is what I need to do to manage it. And I’m willing to do what ever it takes to manage it and it just takes an intense amount of discipline, and it is so so hard. And I don’t mean to make it sound like it’s Oh yeah you just work at it and it’s gonna happen. It was the most intense year of my life to try to really get this under control, and I feel it will continue to be intense. It doesn’t really let up. We don’t have the luxury of running up, but it’s so worth it and it has the reward. And I guess we don’t take for granted anymore the simple things. Shondra: I went for a 4 mile hike a few weeks back, and I was actually kind of afraid to do it because I haven’t walked like that for a long time. And that will, will I able to do it? Will I be completely sore and unable to move at the end of the day? As the person knows when the people ask, (inaudible) I never thought that going for a hike someone would even think about. Yeah I guess there is beauty that has come out of this where I learned not to take for granted the wonderful things that we can do with our bodies. That we can be here, and help one another, and go for walks, and things like that where I feel like I reached such a point of despair. That now I’ve come to a point of, it kind a sounds weird but I’m also thankful for what I’ve been through to understand that there is more. There is more to life than just getting by, working hard, and pouring my life into you my children, and my faith, and my God, that I serve and those sorts of things. That is what it’s worth. And I continue to think in my head what do I want, what do I want more? And so even when it does get hard to keep focused on those things. I feel like, it’s just been a journey all these difficult things that brought me to a better place than when I started. Clint: Yeah. Well there’s so much in that you know we have this cross to bear and it’s what are we going to do with it, because we can’t change that. So forget about that, let’s stop questioning why, why me? That doesn’t help. They’re bad questions and look I think we need to resolve them at some point and we need to, I resolved them very very logically. I said I took antibiotics for 5 years like an idiot for a whole bunch of years when I was in my 20’s. And I had signs that my digestion wasn’t good years before leading up to getting rheumatoid, and I didn’t exercise those years leading up to that either. So when you eat a Western diet just by doing that alone you’re at risk of developing this. So let’s acknowledge that we all contributed to our own situation. So let’s now accept that let’s do everything we can to live a symptom free life. And what does that require, it requires this, and there’s a lot of these things in this, all the things you’ve talked about now and we have to do them all. And the degree to which we adhere to those things will be proportional to the quality of our life, and the reduction of our pain levels, and there is beauty somehow in living a disciplined life, there is. Clint: And it is harder to pinpoint than the problems right? The problems are easy to pinpoint, but the benefits are always equal and opposite life is balanced. There is something in our lives that is a benefit when we have a perceived negative ,and it’s only up to us to find what those benefits are. So whether it be a deeper level of gratitude that you’re talking about, whether it be a more of an appreciation of the little things. And although we might not value these as much as being able to eat whatever we want, and feel that we’re invincible, and party with our friends. They may be from a universal point of view have a high degree of importance. And so there is balance in all this, there’s balance in being able to help others as you are now doing, and there’s a balance to being able to not just on this platform but to inspire your children. You know you inspire people when you apply heavy discipline like this, people although they think you might be crazy deep down. There’s an incredible amount of respect, they’re like I don’t think I could ever do that, I don’t know how she does that. And there is an admiration, a respect, and things that we might not at first see but it could be strengthening the relationship with your husband who sees you in a whole new light and says if she can do that she’s my princess. And the self respect for yourself, I mean once you’ve overcome something like this, once you’ve been able to see what is necessary and to be able to follow it through and to do it you know you can do anything. Clint: Everything in life is now easy compared to this. Home schooling your three kids, bringing them up to be fantastic adults, teenagers, and in adults. And everything that you might face in life becomes just surmountable compared to what you’ve been through, and you develop this invincibility against other problems. And all of this is highly valuable stuff that some people go through in life and never experience. And so although the pain we wish we’d never experience and for those many people who are still in the pain, still struggling with. But there is no alternative that I believe other than going through the steps. and working on it daily. There is no alternative that is a better approach. Shondra: Yeah and there is nothing special about me anyone can do it. It’s just a feeling when people say oh I could never do that or you know people say that about coffee, Oh I could never get up coffee like you did. Well you know what, I didn’t want to either but if the pain is deep enough and worse enough you will. If it’s bad enough for will, and you can. I think it’s just the commitment, and for me I have faith in Jesus. There are some days I couldn’t get out of bed and Inused to you know what, I felt like there was something that I was called that day. And if I was going to get out of bed he had helped me, and so you know it’s just there’s everyone else purpose, and everyone has a calling, and I feel like we need to overcome the difficulties in order to achieve those and for me this was it. And but nothing special about me except that I have a faith that got me through it, and an amount of discipline that only through his strength was I able to do it, anyone else can do it as well. Clint: I share that faith with you too, number of times I prayed and asked for help is countless. And I think that the power of prayer and asking for divine intervention through God for me it’s very powerful as well. So we share a lot of parallels in our stories, and it’s been great to have a chat with you today. Thanks for being so honest and talking about a lot of nice things other than just the physical side that’s always. Because we’re such emotional creatures, and it’s such an emotionally draining and challenging condition that it’s good to for us to talk about that side of things. Thank you. So I’m going to let you go now and and enjoy the rest of your what must be evening. And I look forward to chatting with you more online and keeping you well. Shondra: If I may say thank you so much for this program. Thank you for having the insight that you have. But also that you’ve been willing to share it and because I know there is an immense amount of work you put into it, and it’s not just the program you’ve developed but the words that you used to encourage have meant so much. I feel like at times I would get up your monthly support calls and that is the words that you spoke, not about what supplements I should or should not take or the there but it was your encouragement to keep going. The acknowledgement of how hard it was. I needed someone to tell me and to say yes, this is hard. That meant so much, because i felt like. There’s other people who’s kind (inaudible) it or minimize it. And don’t mean to but they do and so just to hear from someone yes it’s hard, but yes you can do it has been so helpful so thank you. It’s meant the world to me, and it made all the difference. I really appreciate it. Clint: Awesome thank you. You’re very welcome and I appreciate the feedback as well. I do enjoy those monthly calls. If anyone is listening and wondering what you’re talking about. As part of our support group we do the monthly calls, and sometimes I host them myself and I just field questions one after another. You don’t have to appear on video but you can if you like and talk with me one on one it’s all private just for our support group. You can ask questions on the chat bar, and I’ll answer questions in detail and help people in that format. And that’s of course on top of the daily interaction I have with other members as part of the standard way that our support platform works. So we open once a month so I can handle the influx. I don’t want everyone joining all the time, I just want to be able to take people once a month. And I’d love to invite everyone listening to this to come join if they’d like some help for myself, and talk to Shondra and more. Almost all the other guests that we’ve had on our podcast are all members of our support group and we all help each other and it’s a wonderful platform. So thank you so much. And I was going to say sometimes on those calls we have doctors too, we’ve heard Dr. Klapper. Our next doctor who appearing is Dr. Goldberg, from The Goldberg clinic. He’s going to be our next guest doctor who has come into to offer some help and support on the monthly call. Clint: Okay. Thanks so much Shondra, really appreciate you sharing today. And we will chat online. Shondra: Wonderful, thank you so much. A wonderful report, Shondra and interesting to me as I once suffered from psoriatic arthritis but now I no longer do after following the Paddison Program and remaining on a vegan diet and doing other things that help.